As we ring in 2010, we thought we might look forward in time by looking backwards. Sound strange? Well, here is the thinking. 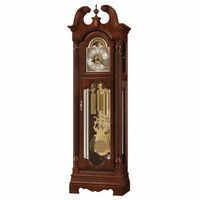 If we know what are the top 10 Features that people most want in their grandfather clocks, mantel clocks, atomic clocks, wall clocks, etc., it will help us all to offer clocks to better meed the clocks sale needs of customers everywhere. Here is our guess at a Top 10 clocks features list. We would love input and look forward to sharing it over time. 1. Clocks on sale or clocks discount. Sorry, but had to get this one out of the way, even though it may not technically be a clocks feature. We know it’s top of mind of most consumers shopping for discount grandfather clocks and other clocks, so we thought we would get it out of the way (and remember our Low Price Guarantee!). 2. Atomic time. Atomic clocks, formerly and still also known as radio controlled clocks, are an incredible innovation in timekeeping accuracy. Gone are the days when workers argue about when the 5pm quitting time really begins, and gone are the days of hospital workers who may have to note the time of death (sorry on such a cheery subject, but a reality, and a good example) with no issue of accuracy. 3. Automatic night time shut-off on grandfather clocks, mantle clocks, and wall clocks. 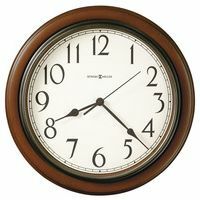 Customers who purchase clocks with this feature have the HUGE advantage of having their clock shut off its chime automatically every night at, say, 10pm, and start up again the next morning at, say 7am. Some customers have commented on how helpful this feature can be if they have a clock in a room in which visitors sleep over. They have the option of turning the chime off. Others just love it because they think or fear the sound-chimes might bother them. it really a personal choice, but it is a great one to have. 4. Illuminated Dials. While not new in general, this feature is reasonably new to some high-end models of grandfather clocks, most notably some Howard Miller Grandfather Clocks. Some have illuminated interiors as well. The big advantage is one can see both the clock’s time, and the clock and dial, even when the light is out. It is cool! The only downside is that the clock needs to be near an electrical outlet. But this is a reasonably new feature many people love. 5. Ave Maria and ode to Joy Chimes. In very recent years, the high-end clock makers have introduced movements that many times in addition to the Westminster Chimes, offer one or both of the Beethoven ode to Joy and/or Schubert Ave Maria Chimes. While the Westminster Chimes has been the overwhelming favorite for decades, even when customers have triple chime grandfather clocks, there are many many excited customers eager to also have one or both of their Ave Maria and Ode to Joy Chimes on their Clocks. 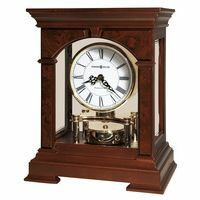 And these have been made available not only on quartz movement mantel clocks and wall clocks, but also on some grandfather clocks as well, such as the Howard Miller Clayton Grandfather Clock Model 610-950 (610950) . We expect this feature with these chimes to be much more popular in the coming decade. 6. Customization of clocks, especially custom or customized atomic wall clocks. We have seen an increasing desire on the part of businesses and other organization to have atomic clocks, which were addressed above, but with dials that are customized to their needs. While this might seem simple, many clock manufacturers have stumbled in this area. We have been able to address this issue with some special design approaches. And customized atomic clocks for home and office and other organizations will only increase in popularity! 7. Contemporary grandfather clocks. Many people, and we do not agree with this thought, but nonetheless, many people think of grandfather clocks as very traditional and perhaps out of date for today’s times. We hear this at 1-800-4CLOCKS.com quite frequently. Despite the fact that we think there is nothing more beautiful than a traditional or contemporary grandfather clock, and that it adds great home decor value and should be recognized as a treasured piece of furniture, some people are “turned on” only by the contemporary grandfather clocks. We’ve had clocks of ours of a contemporary nature featured both in TeenVogue as well as on a National NBC Home Rescue show. Contemporary is here to stay, and will open up many new avenues and new demand. 8. PC or computer or iPhone or Cell Telephone Clocks. To be writing about this subject and not recognize the reality that people are seeing the time in many more ways than they ever have before, whether it be on their Apple Mac or PC or iPhone or iPod or simply a basic cell phone (and we’ll mention Google’s Droid phone here too, because we like Google). Gone are the days of Victorian England when Parliament had to legislate Public Clocks and Pub clocks so the masses would know what time it is. We believe that the home decor and collectible value of clocks of all types will mean that they will be in homes and offices for many generations to come. it’s interesting that very recent studies show that with so many sources for time, clocks and watches still receive 90%+ of the views when an individual is seriously interested in knowing what time it is. 9. Clocks for Special Needs or Special Markets. Technology is allowing clocks to be made which are leaps and bounds ahead in serving individuals with special requirements. For those who are hard of hearing or have difficulty waking up in the morning, clocks are know available which will not only shake your bed, but they will also have varying forms of strobe lights, AND they have alarms that will knock your socks off, literally and figuratively. For people who are vision impaired, the shaking and the piercing sounds can be an amazing blessing. We plan to be carrying these types of clocks very soon. 10. Green clocks. Would you believe that there is a clock on the market that literally runs on water. And it’s an LED clock, not tied to a bucket. We will right more about this amazing clock, and may soon carry it. And solar clocks are making headway in the market. we expect to see a lot more. So what do you think? Will we soon have a solar powered atomic customizable grandfather clocks selection? Which features are most important? What new ones should we be looking at? PLEASE share your views with us so that we may serve you better!